Closeup on Thornbury Townshp: Early one day this spring, during my morning walk, I was admiring a newly planted garden on Locksley Road when several little heads popped up over a fence, intent on watching my every move. It was a magical moment, bringing my walk to an abrupt halt and starting a fascination that led to many return trips to this place. The road was completely quiet, the sunlight was just coming over the hill as these gentle creatures worked their way through the pasture. Just minutes away from the hustle bustle of Routes 202 and 1, time stood still. I had driven by this property many times before, but the only thing I noticed was that the new owner recently installed a fence. I figured they were bringing in horses, which is not uncommon for this area. A fringe benefit of my new walking routine, however, was being able to see my neighbors and environment from a completely different perspective. And I was so happy to discover that there was an alpaca herd mere footsteps from my own home! Up close and personal with an aplaca. Pam Gougeon, owner of the alpaca farm, came out to greet me. After a brief conversation, she ushered me into the barn to see a newborn cria–not even 24 hours old! Mother and baby stood together, filling the air with a gentle humming, as if in meditation. I felt privileged to be in their presence. I took a few photos with my phone and promised I’d be back with a real camera. It’s been a month since that day and mommy and baby are doing great! And the herd is as curious as ever! 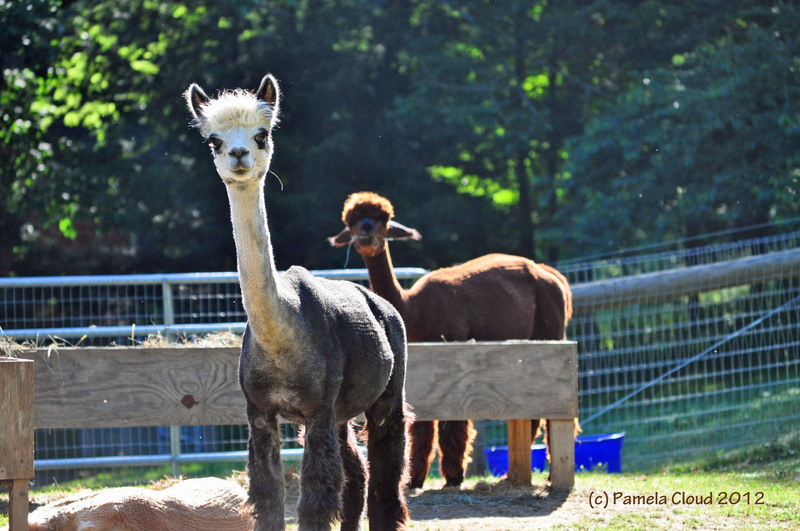 Trotter Hill Alpacas came into being a little over 2 years ago when Pam purchased a house and barn on five acres in Glen Mills, Thornbury Township. Trotter Hill is open to the public by appointment. Both yarn and alpacas are for sale. Knitters are invited to pack a lunch and sit by the pasture while they select their yarn. And what a view! You really haven’t lived until you’ve come nose to nose with a curious alpaca–and they will come up to your nose and sniff you if you stay very still. It is so cool!! Knitters prize alpaca fleece for its lustrous fiber–it is lighter and softer than wool and warmer than cotton. 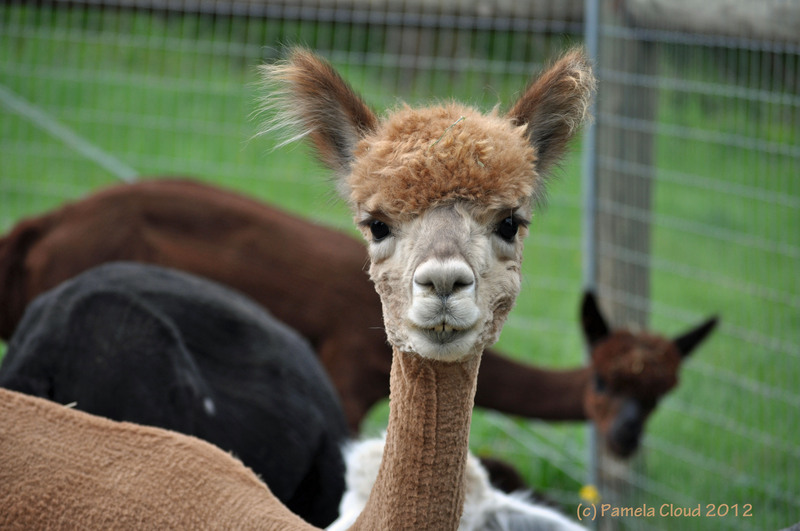 And the alpacas themselves are easy to care for – easier than horses, according to Pam. 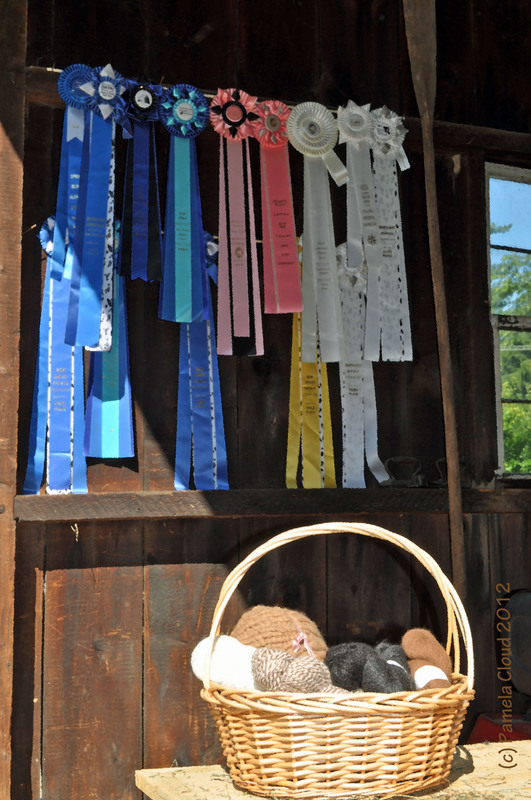 During the 2011 season, three yearlings brought home three firsts and a second in two shows! The rustic feel of Thornbury belies the fact that Target and Home Depot are only a five minute drive away! So, if you like country living and farmer’s markets, but also like access to a place that serves latte, Thornbury is worth considering. About Thornbury Township: There are two Thornbury townships; one in Delaware County and one in Chester County. They were divided in the late 1700’s when farmers were allowed to choose to stay in Chester County or become part of the “new” Delaware County. This Thornbury is conveniently located between West Chester and Media and is bordered by Edgmont, Chester Heights, Concord, Middletown and Chadds Ford townships and served by West Chester School District. The housing offering is diverse, running the gamut from historic mill homes to 60’s ranchers, to newer townhomes and upscale developments. The nice thing about it is that they are all within miles of each other and blend together in a harmonious way due to thoughtful planning. While there are no major roads cutting through Thornbury, major routes can be accessed within minutes to get you quickly to Philadelphia, Wilmington or King of Prussia. Thinking of moving to Thornbury? There are currently 39 homes for sale ranging from $190K-$2M, with an average asking price of $607K. Since the beginning of 2012, there have been 32 sales, averaging $461K. 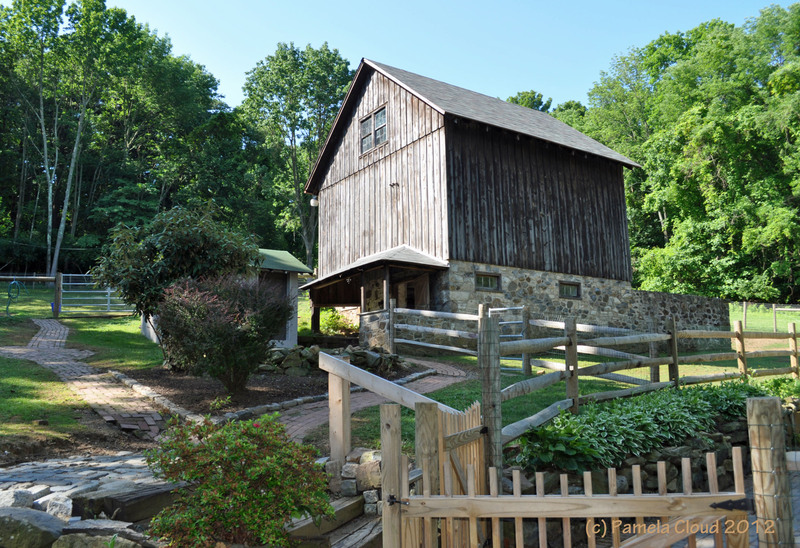 Click Here for a Current Listing of Homes for Sale in Glen Mills! About Me: I am a Thornbury resident and full time real estate agent with Keller Williams Real Estate, serving Chester and Delaware counties. I love to photograph landscapes, architecture and areas of natural beauty while providing insight into the community. If you would like to schedule a buyer or seller consultation with me or just learn more about the market, please feel free to contact me on my cell at 484-883-8231 or email me at pamcloud@kw.com. View or search the current inventory by clicking here. Pam, This is awesome, what a great find! Thank you so much and thanks for reading Katy!